If you enjoy magic shows and in particular the famous magician Dynamo then head over to Gala Casino and you could win tickets to a private show. All you have to do is play at the casinoâ€™s re-designed live casino this month and youâ€™ll earn entries to the prize draw. Every Â£50 you bet at the live casino will award you one entry. There is a prize draw each week and there is no limit on how many tickets you can earn for each draw. Each week four players will win a pair of tickets to see Dynamo live in London at the end of September. 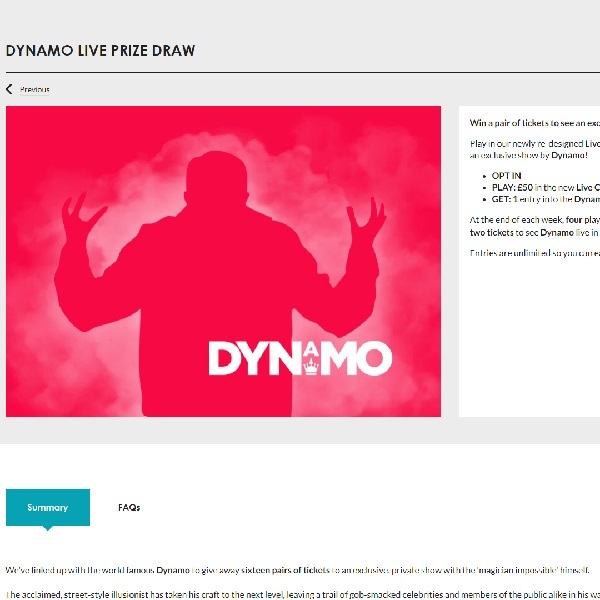 The prize includes complementary food and drink, a private show with Dynamo, photos and signed merchandise opportunities. Start playing at Galaâ€™s Live Casino today and you could win this fantastic prize.